Taking vitamins seemed much more exciting when we were children. From the Flintstones brand to fruity liquids to gummies, getting your nutrients was much more of a treat than a task. Cut to two decades later, and vitamins are way less alluring. The good news is that gummies aren't just for kids anymore—in fact, adult gummies have been on shelves for a long time, and their increasing popularity has encouraged more brands to jump on the bandwagon, making vitamins an enjoyable part of our day once again. Below, we interviewed a few top nutritionists and asked them to share the best gummy vitamins. Take a look at what they had to say below. 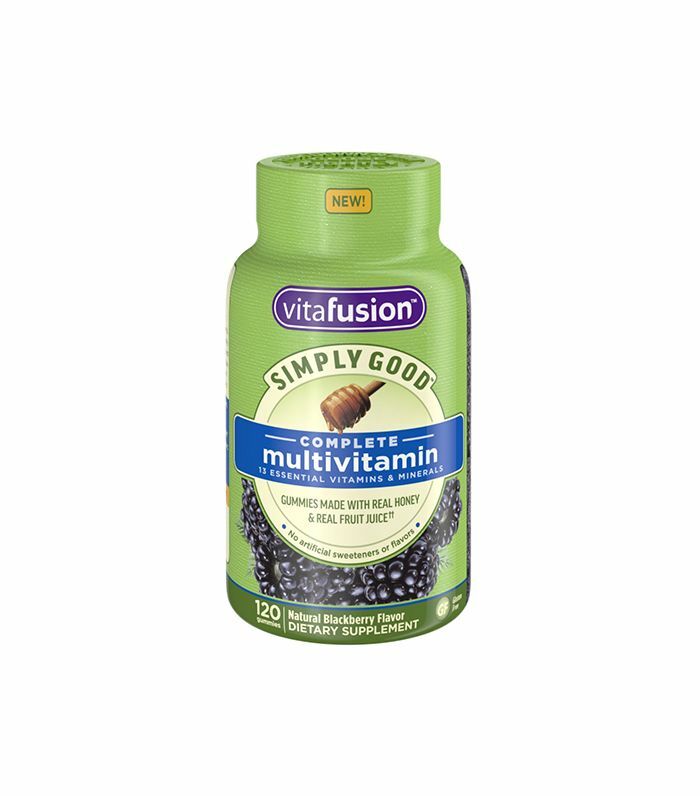 "Vitafusion's Simply Good Complete Multivitamin is a good one," says Alissa Rumsey, MS, RD, founder of Alissa Rumsey Nutrition and Wellness. "You only need to take two gummies a day, and it only has three grams of sugar. It also has the simplest ingredients in the vitamin as well as having a good amount of vitamin D and B. Vitamin D is especially good for the winter months and for people who do not get a lot of sun on a daily basis." "I prefer Nature Made gummy vitamins," says Lisa Moskovitz, RD, CDN. "They are USP verified, which means they are tested and meet specific requirements set out by the United States Pharmacopeia." The Olly brand utilizes the research and savvy of naturopathic physician Taryn Forrelli, ND, who says that these skin-geared gummies "deliver purifying antioxidants and minerals to support cell detox, hormone health, and proper metabolism, plus a concentrated botanical blend of spearmint, Aronia berry, and dandelion." Sarah Greenfield, RD, loves these Hum gummies because of their proven ingredients. "Some key nutrients include biotin, or B7, which helps the body break down proteins needed for hair growth," she explains. "One study found women experiencing hair loss had a biotin deficiency and adding biotin supplements helped increase hair growth. Zinc plays a role in immune function and also helps maintain the health of hair follicles, leading to the growth of healthier hair. Fo-ti, a Chinese herb is included to help decrease graying by increasing melanin (hair pigment) production." While Amy Shapiro MS, RD, CDN, advocates for gummy vitamins primarily for children or adults who have trouble swallowing pills, she's a fan of the Nordic Naturals brand for gummies, especially its omega-3 blend. It's ideal for those with picky palettes or vegetarians (eggs and fish like salmon, herring, and mackerel are high in omega-3). Shapiro is also a fan of the brand Rainbow Light and recommends its gummy varieties. They're totally natural with no artificial flavors, colors, or preservatives. Up next, learn how to meditate in less than a minute.